In addition to Gaiola, the spooked little island off the Posillipo coast that everyone knows is haunted, there are at least two other so-called "haunted houses" in the city, buildings where terrible things are known to have happened, and, no doubt, other terrible things that are said to have happened never did but probably will if you get too close. One is at via Tasso 615 (photo, left), at the very top of the hill (about 500 feet above sea-level) where that road then swings left out to the long drive along the Posillipo ridge or turns right for the main road into the Vomero section of Naples. According to a sign near the high metal scroll gate, the building is called the Corte dei Leoni ("Court of the Lions"). The villa is about as set–off as it could be in an overbuilt city; that is, though one side of the villa is across the street from the standard markets and cracker-box buildings of the 1950s, the other side is right at the top of a steep slope with nothing in the way to obstruct a spectacular view of Vesuvius and the Bay of Naples (photo, below). 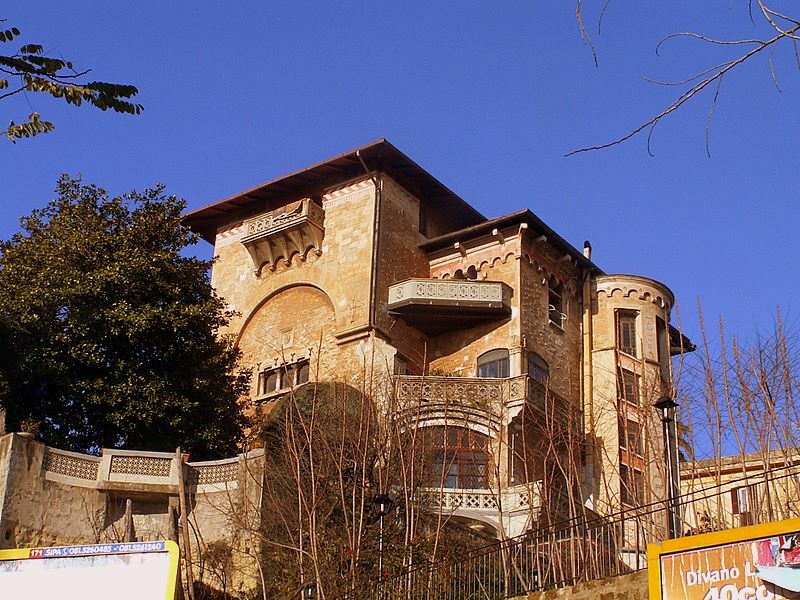 The Corte dei Leoni was originally called Villa Spera and then Villa Giordano. 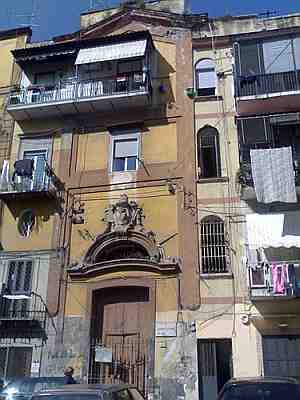 It is not typical architecture for Naples. It is a three-story, irregular but roughly rectangular pseudo-Renaissance building. It has arched windows with prominent keystones and columns on either side and a pale-red brick façade with enough protruding bricks to give it a softened ashlar effect. Placed high up on the façade in various places are a few graven symbols. Two that stand out are on either side of a large window. They appear to be some version or other of the winged caduceus, the staff carried in Roman mythology by Mercury. The wings are there, to be sure, but on top of each staff is a stylized horse's—or dragon's—head. They face inward and "look at" each other across the arch of the window. The roof, in Renaissance fashion, slopes gently down to all sides. As the villa is actually built on a slope, that part of the building that faces the sea has an additional story using the extra space provided by the rapid change in elevation from the front of the property to the back. There is dark or stained glass in most of the windows. On the seaward side, there is a remarkable spiral stairway that winds the height of the building; it is on the inside, but encased in glass and very visible from the outside. The entire property is protected from the street by a high iron fence webbed with ivy, such that it is impossible to look into the grounds. There is a stone plaque embedded in the façade that reads 1922 in Roman numerals; it also names the architect, Adolphus Avena (using the Latinized version of "Adolfo") (1860-1937), but the stone is weathered enough to look much older than that. On the sea-side there is also a balcony. The whole effect is Renaissance, yes, but so foreboding that if Juliet, herself, were to walk out on that balcony and call down to me, "What satisfaction canst thou have tonight?" I would leave. The only other information provided by a small notice board near the gate is that the premises are available for wedding receptions, banquets—that sort of thing. I don't think they get many takers, because everyone in Naples "knows" it is haunted. I have been unable to trace the source of the superstition. The one terrible thing that has happened there in my memory was just a few years ago. A woman was walking by the house early on a Sunday morning. Except for her, the street was apparently deserted, for there were no eye–witnesses. The scene, itself, provided the details: there is a large tree on the grounds and, as she walked by, a high branch hanging over the fence and above the street chose that moment to snap and fall, striking the woman in the head and killing her. That sent "I-told-you-so" headlines shivering across the newspapers for a few day. I don't know how many legends of haunted house we're talking about here—at least one, maybe one and a half. In his Neapolitan Stories and Legends, Benedetto Croce has a short section devoted to Haunted Houses (palazzi degli spiriti). Much of it is given over to the goings-on at the Palazzo of the Prince of Sansevero (which you may read at this separate entry). Generally, he talks about the legends of very old houses, some going back to the 1500s. Some are amusing, as he says, and some are grotesque, as he also says. He has already mentioned Palazzo Donnanna and the residence of queen Giovanna (Joan) elsewhere, so in this brief section he goes on to something funny. If you drop down to Santa Lucia, near the Egg Castle, they tell you there was a house here where a giant shadow showed up to haunt from time to time and throw stones at people who disturbed him. They called him Faccione because of the shape of his head—the word means Big Face. A mean-sprited spirit with a huge head. That's pretty funny. Or maybe you had to be there. It gets nastier going back to the 1500s and the now totally urbanized section just north of the main train station called Vasto (or Vicaria) and a villa called Paradiso—arcades, fountains, gardens, statuary—and a cryptic Latin plaque praising the gods of mythology. It was built in the early 1500s by one Colantonio Caracciolo, whose son, Galeozzo Caracciolo, however, decided to leave Naples and Italy and move to Switzerland to become a Calvinist Protestant! Galeozzo's son, also named Colantonio, inherited the place and it went downhill fast (this is the 1550s). Young Colantonio was accused of heresy (because of the plaque, dated 1543). It obviously generated evil spirits. Everyone knew the place was haunted. Even skeptics, says Croce, would tell you that there “is something out there.” It eventually just fell to pieces and the spirits decided it was no longer worth the effort. A much worse and violent scandal took place in 1556 in the Convent of Sant'Arcangelo a Baiano... The convent, built in the 13th century by the French Angevin kings to celebrate their defeat of the previous Swabian dynasty, was run by Abbess Laura Baiano and included as nuns a number of noblewomen who had been forced by their parents to take vows. Some were daughters of the most prominent families of the city, accustomed to a life of luxury and good times and were not at all pleased to find themselves locked behind convent walls, dedicated to a life of prayer and sacrifice. This group included Agata Arcamone, Giulia Caracciolo, Livia Pignatelli, Chiara Frezza, and Laura Sanfelice. A painter...Tommaso De Vivo did a large painting that you could see in the rich art gallery of the prince of Fondi, the murder of the nuns of the Sant'Arcangelo a Baiano, poisoned, stabbed, thrown from windows. I had read about this in Dalbono's Neapolitan Legends1 and elsewhere and when I went up there for the first time and walked along the old alleyway that leads to the now modernized church I had the impression I was treading on soil of the damned. But Croce is no rumor monger; he then also cites his favorite historian of southern Italian history, Bartolommeo Capasso who says that the scandals of SAB are “regarded by critics as apocryphal and fantasy.”2 In spite of that, Croce thinks there is probably some historical basis and cites a few sources that support the tales of the scandalous behavior mentioned by Mr. Mangiafico, even if not to the extent shown in the painting by De Vivo (1790-1884), where you actually see atrocities being committed!3 It is also possible, says Croce that the ancient monastery was going to be closed anyway; Catholic Italy was in the midst of the Counter Reformation and church authorities were moving nuns into strictly segregated quarters called “cloisters”. *1 The reference is to Carlo Tito Dalbono (1817-1880), the Neapolitan historian, novelist, critic and collector of popular traditions. Dalbono published Le tradizioni popolari spiegate con la storia e gli edifici del tempo [Popular Traditions Explained through History and Structures of the Times] in 3 volumes between 1841- 1843. This particular story is dealt with by Dalbono in grimmer detail than by Croce... including an ecclesiastical court in Rome passing sentences on those who engaged in particular debaucheries or committed heinous crimes and then sending assassin/executioners down to Naples to carry out the sentences! —all of which led to tales of the spirits that haunt the area. Dalbono, at least here, is not an historian; he's something else. He never uses the word 'anthropologist', but that comes close. His stated purpose (in the title of his book) is to account for the existence of legends. The main legend here is debauchery in the convent and the other one is the savage nature of revenge by the church ("the murder of the nuns of the Sant'Arcangelo a Baiano, poisoned, stabbed, thrown from windows...”) That is the “half-legend” I spoke up, not the debauchery, which “everyone” knows about and smirks over, but the subsequent insane violence of retribution. Dalbono starts his piece by saying that no power has caused such irreparable harm to the city of Naples as the Spanish vicerealm (1500-1700) (because of the unnatural institution of nunneries in the first place). That is his agenda, explaining the cause of legends, not just cataloging them, and he has similar explanation for each of the legends he recounts. Dalbono cites his own sources for his account of the gory details, Le Couvents [Convents] de Bajano, Paris, 1828, an anonymous tract. He doesn't say he believes it, just that it's a legend and here's why ("...the unnatural institution of nunneries..."). Popular literature on the subject—indeed, even paintings such as the one by De Vivo—that is all part of the point he is trying to make: this is how legends start and grow. He may not even care what is true. Dalbono is interested in the legend-building process. After the initial exposure of the monastery in the mid-1500s, the monastery was abandoned and then it decayed. It developed a reputation as being haunted by the spirits of the murdered. No one wanted to go near it, which made it useless as a refuge for plague victims when that epidemic devastated the city a century later. Thus, the pope in the mid-1660s (Gregory XIII of Gregorian calendar fame) condemned it as a lost cause and had much of it torn down, leaving only the small church standing. So, Croce is telling a story he got from Dalbono who is citing an anonymous French source written in 1828. In his footnotes, Croce reminds us that public enthusiasm for scandalous tales of clerical misbehavior coincided with the periods of liberal revolution in Naples (that is, 1821, 1848, 1860). *2 Croce cites B. Capasso in “Archivio storico napolteno, XIV, pp. 708-709. *3 Croce does not say that he has actually seen the painting, but he writes as if he knows what it depicts. It doesn't depict the original debauchery, but rather what came afterwards. It seems to me that Croce has fused them into one. At no point does Croce mention Dalbono's account of a Vatican band of assassins and executioners. Selene Salvi, friend, artist and researcher, is trying to track the painting down. She tells me that (1) in 1845 the work was at the Palazzo Fondi location in Naples, (2) was displayed at an exhibit in Naples in 1877 and (3) that the Fondi art collection was then scattered by sales to private collectors but that a significant part of the collection is now in a museum in Potenza. Other works by De Vivo are still housed in local galleries, so if it exists, maybe she'll find it. Croce has no illustration in his pages about the convent of SAB and Dalbono has the one shown here (image, right) (which I hope to replace with the De Vivo painting sooner or later). So, it sounds to me as if there is really one legend and a half—one is of scandalous behavior, plausible; the other is of stabbing, poisoning, and throwing people out of windows. I don't know of a way to call the Vatican library and delicately ask them if Pope Pius IV ever sent a hit-squad to Naples.